Celebrating Older Americans Month This May! Congratulations to the 2018 DSPs of the Year! Do You Know About MediSked's Resources? Celebrating Direct Support Professionals Across the Country! March is National Developmental Disabilities Month – How Will You Celebrate? What Does The "Internet of Things" Have To Do With Your Agency's Electronic Records? People, not consumers. IKEA gets it. The Overtime Final Rule Is Here- Now What? What's the Right Way to Transition to Managed Care? Stop By & Say Hi at the ANCOR Conference! How Does Your State Rank When It Comes to Employing People with Disabilities? See the Best & the Worst. What Are We Doing at I/DD Agencies Today That We Might Regret 20 Years From Now? Software Has Evolved to Be More Person-Centered. Have You? When It Comes To Respectful Language Are There More Questions Than Answers? A lesson in empathy: How parents feel about "letting go"
Did you hear about Oklahoma's Wait List Problem? It's out of this decade. The Washington Post Asks "Why a man with intellectual disabilities has fewer rights than a convicted felon" and we want to know why too. Attending the Arc's National Convention in Indy this Weekend? Stop By & Say Hi! Need A Great Reason to Like Buffalo Bills WR Marquise Goodwin? Watch This. New CDC Report Says 1 in 5 Americans Has a Disability. But What Does That Mean? Fast Food Workers Deserve $15 An Hour But Direct Support Professionals Don't? MediSked Wants to #EndTheAwkwardDC – Can You Help? Speak Up & Fight for I/DD Funding. Louisiana Did & Their Legislators Listened. Is There An I/DD Housing Crisis On the Horizon? New Program in Illinois Isn’t Creating Jobs for People with Disabilities. It’s Helping Them Create Their Own. 4 RIT Students Design a Wheelchair Swing for the Local Arc. Joy Ensues. What Does "Person Centered Planning & Services" Mean To You? What's the Deal with Meaningful Use & DD Providers? Is Autism Something That Needs to Be Cured? Writing an RFP for Provider Agency Software? Read This! Comparing your manual audit controls against HIPAA Compliant software? Do you have a dashboard for provider agency management? DD Providers ask "How do I transition to electronic records"
A Honky Tonk Good Time at NAQ! What is the total cost for software for home health agencies? How are you leading change by implementing Developmental Disabilities software? Looking for an I/DD EHR System? Be careful what you look for! MediSked Connect, are you just using your computer for Facebook? MediSked Volunteer Corps 2014. Here to help! MediSked Weekly News Round Up! Check out the stories we are watching this week at MediSked! The Crash Reel in partnership with WXXI, are we doing enough for everyone? What's theTotal Cost of Ownership on new technology for DD providers? Is a better way to manage medicaid billing on your plan for 2014? MediSked Blog: Why community inclusion and employment matter. How committed are Direct Support Professionals? Very! Inspiration in the Land of Lincoln. MediSked Connect's Brian White, "Why I work in human services." What Does Electronic Waste Have to Do with People with Disabilities? Is There a Mall Around Here?? Providers ask "How do I transition to electronic records"
How much does a Provider Agency Management Platform cost? Do your manual audit controls beat HIPAA Compliant software? Arc Guest Blog: What Can You Gain from The Arc’s National Convention? Technology for DD providers - Why make the change from status quo? What can you track with DD services tracking software? What does HIPAA compliant software mean? What's happening to DD Providers going to managed care? 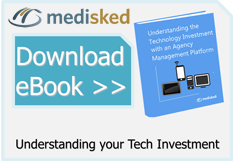 Break down the silos of your current provider agency management systems! MediSked in Orlando: NCE meets the mouse. The Stars at night, were big and bright! What does your dashboard look like for provider agency management? How would you grade your utilization management of Medicaid funds? Does your 2013 strategy include a scheduling solution? How MediSked Connect can improve quality of life, and save your back. How do you attract and retain home care aides? What does cloud based mean? Is there a scheduling solution for direct support staff? Going Paperless: How much paper do you really use? Top Ten Questions We Get asked - #1 What makes you different? Top Ten Question’s We Get Asked: #2 - What if we don’t use a schedule? This Week is National Direct Support Professional Recognition Week! Top 10 Question's we get asked: # 5 Will my state accept documentation from MediSked? What Does Web Based or Cloud Mean? Top Ten Questions We Get Asked - #7 Who else is using you? Top Ten Questions we get asked - #8 How much does it cost? Benefits of an Agency Management Platform over paper. Top Ten Questions we get asked - #10 Do all of my staff have to use this?